“That Melt-Banana is making some of the best music of their career—over 20 years into the band’s existence—speaks to the universal and transcendent quality of their noise. The landscape of media, society, and even the microcosm of noise rock has changed greatly, but Onuki and Agata have locked jaws on the diametric constants: energy versus agitation, phobia versus euphoria, and instant nostalgia versus the relentless pursuit of the upgrade.” -Jason Heller, Pitchfork. If all that hasn’t managed to convince you to see Melt Banana for yourself, then it’s worth also noting that the legendary John Peel went as far as to describe them as “one of the world’s great bands”. 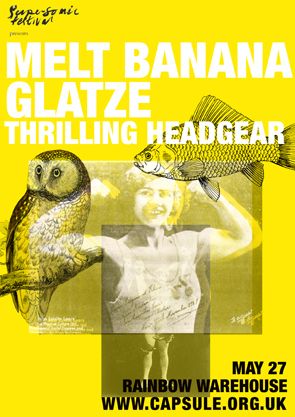 Tickets for Melt Banana + Glatze + Thrilling Headgear at the Rainbow Warehouse May 27th can be purchased here.